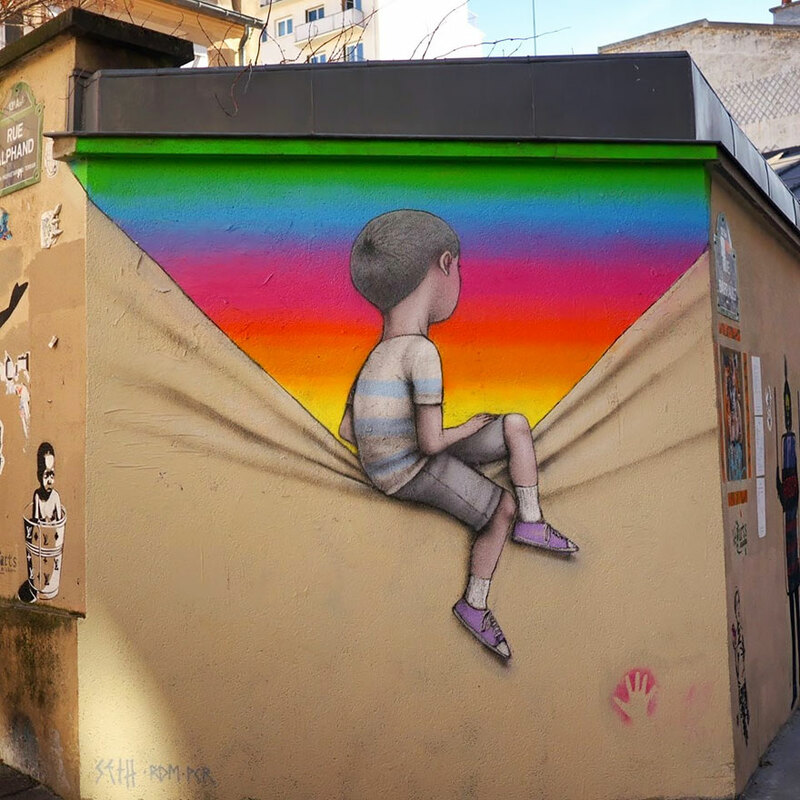 Doing research for one of my assessments I came across this french artist Julien Malland, known as “Seth Globepainter”. I had an idea to draw a little girl with a paint brush who I would take with me and travel across the city and photograph her colouring boring, dull buildings. This artist did actually do paint boring buildings himself. Street art is associated with negativity as some graffiti artists who are considered as vandals do their artwork without permission in prohibited places. We all know Banksy or I would rather say no one knows him (featured image is his work by the way). He is an example of a graffiti artist, political activist whose street art has spread across the world and became very much treated as a form of art rather than vandalism. Let’s have a look at some of the Julien Malland’s art pieces which he created across the world in the coutries such as India, China, Mexico, Indonesia, and Vietnam. Personally I would love to live in the city that looks like one big art gallery. Those paintings brighten up the city and lift up your mood. Imagine walking back from work or college on a rainy, grey day and seeing those buildings around you rather that boring office buildings. What I admire most about street artists is that they give the original art piece to the city. Also I must imagine that painting such a large picture is not so easy, never mind how risky it must’ve been to do it on such high buildings. That is why I admire artists like Julien who go above and beyond with their art work. This picture inspired me in particular as the little boy reveals a world of coulours from under a boring layer. That is exactly the message I am aiming to deliver in my artwork. If you are inspired by his art watch this video with my beloved SIA in the background with one of her songs before she became all famous. Great combination.